When you’re working with paint sprayers, you find out right away that it is very easy to create a pretty big mess. 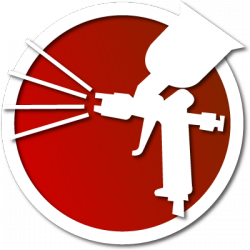 Being able to easily and thoroughly clean your sprayer is incredibly important for its lifespan and its performance, and in this article I explain how to find a paint sprayer that won’t make cleanup a total hassle. Simply put, a dirty paint sprayer won’t work as well as a clean one. That’s because leftover paint can built up into a harmful residue that can compromise the performance of a sprayer, no matter what type you use. The most common issue is dry paint flaking off from the paint cup and making its way into the sprayer, either damaging the system in the process or becoming part of the spray and causing a rough, uneven coat. The most important component to clean in a paint sprayer is the paint cup, since it’s what will have the most contact with the paint. Any model that allows you to fully detach the paint cup is going to be much easier to clean, since you won’t have to worry about accidentally damaging the gun in the process. The same is true of any hoses or tubes on the sprayer, particularly if they come into contact with paint at any point. You are also going to need to pay attention to the spray needle or nozzle on the gun, since it can also experience buildup. However, you’ll want to pay special attention to specific cleaning instruction for each model to avoid damaging the components. Most airless sprayers have detachable plastic cups, which make cleanup relatively simple. You may need to use special solvents for certain types of paint, which can be harmful to the plastic, so always exercise caution here. Airless sprayers will also typically have their own care instructions for cleaning the nozzle, since they are not usually detachable. Compressed air paint sprayers are often relatively easy to clean, thanks to their sturdy metal bodies. While you still need to be careful not to damage any of the components, you can usually use stronger solvents to get the job done. Some models may also include special brushes for cleaning the spray needle or other components. You should always read through the complete care instructions for each model before attempting to clean it, as there may be some components that should not come into contact with water or not be removed after use.